It’s no secret: having air conditioning in your home or workplace makes the summer a lot more tolerable. Air conditioning has many known health benefits, like preventing heat exhaustion. It also has numerous psychological benefits, which can help to keep a family happy and a workplace comfortable and productive. Below are three of the primary psychological benefits of having air conditioning in a home or commercial building. Keeping your air conditioning in working order with regular maintenance will keep it running efficiently, giving you the added psychological benefit of a lower utility bill. Heat is uncomfortable, and being uncomfortable for a prolonged period of time lowers moods and can make people feel more aggressive. This is one of the reasons why road rage collisions happen more frequently during the summer. In a household or office setting, extreme heat can lead to more confrontations and less willingness to be flexible and cooperate between household members and colleagues. 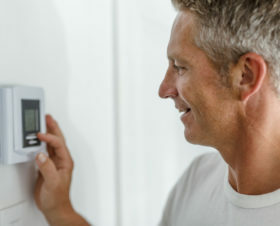 Keeping a house or office at a comfortable temperature can keep tempers cool, improving communication and preventing incidents that occupants might regret later. An air conditioning system cleans the air by catching tiny particles that can trigger allergies and asthma attacks. It can also remove filter pathogens and other harmful particles, like particles of lead dust from the paint in an older building, out of the ambient air, improving the space’s air quality. Living or working in a space with good air quality is beneficial to one’s physical health. When an individual is physically healthy, he or she is often mentally healthier. Physical health in an air conditioned environment goes beyond avoiding allergic reactions and asthma attacks. When the body is uncomfortably hot, it expends energy trying to keep itself cool. While this is happening, an individual cannot think as clearly as he or she would in a comfortable environment. In a workplace, this translates to higher productivity rates when the office is air conditioned. Eight or more hours of uninterrupted, high quality sleep is necessary for mental sharpness during the day. In an uncomfortably hot environment, it is difficult for the body to regulate its temperature naturally, which in turn makes it difficult for an individual to fall asleep. Difficulty sleeping leads to drowsiness during the day, which can increase an individual’s chance of being involved in an accident and lead to other health problems. When you need to have your air conditioning system or any other component of your HVAC system serviced, contact our team of HVAC professionals at Naughton Mechanical LLC to perform the service you need. We can answer any questions you have about heating and cooling and discuss the different types of air conditioning system with you if you are interested in upgrading or replacing your current system.